Jimmy and Dre with some USC students. 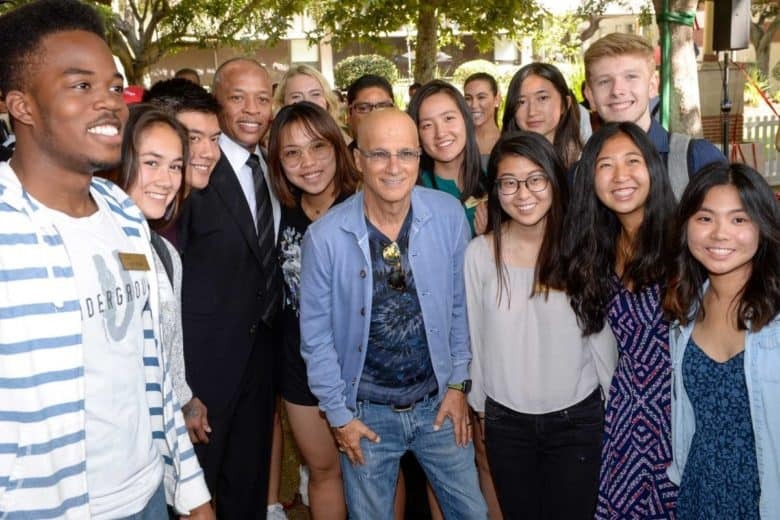 Apple executives Jimmy Iovine and Dr. Dre got construction of their new academy at USC officially underway this week during a groundbreaking event on campus. The duo donated $70 million to USC in 2013. The money was used to create a new program on campus that focuses on four areas: art and design; engineering and computer science; business and venture management; and communication. USC’s Jimmy Iovine and Andre Young Academy for Arts, Technology and the Business of Innovation has become so popular in the last few years it has outgrown the space on campus used for classes. The new building will be a place students can come to work on art projects, whether its 3D printing models, welding metal or editing a new music video. A new academy building is being created with 10,000 square-feet of space. It will open in 2019. Meanwhile, the first batch of graduates from the program will receive their bachelor’s degrees at the end of this school year. Iovine makes frequent appearances at the USC campus where he gives talks to the students. The program has already churned out its first startup called Mira. It launched a $100 augmented reality headset this summer at Comic-Con. The company’s investors include Will.i.am and Salesforce CEO Marc Benioff.